I recently came back from my first stay at Sea Ranch. This was a pilgrimage to visit the works of Charles Moore, William Turnbull and Joseph Esherick, and it was a chance to disconnect and relax. Sea Ranch, which was formed in the 1960’s, is a planned community which was built on the idea of preserving and appreciating the land. 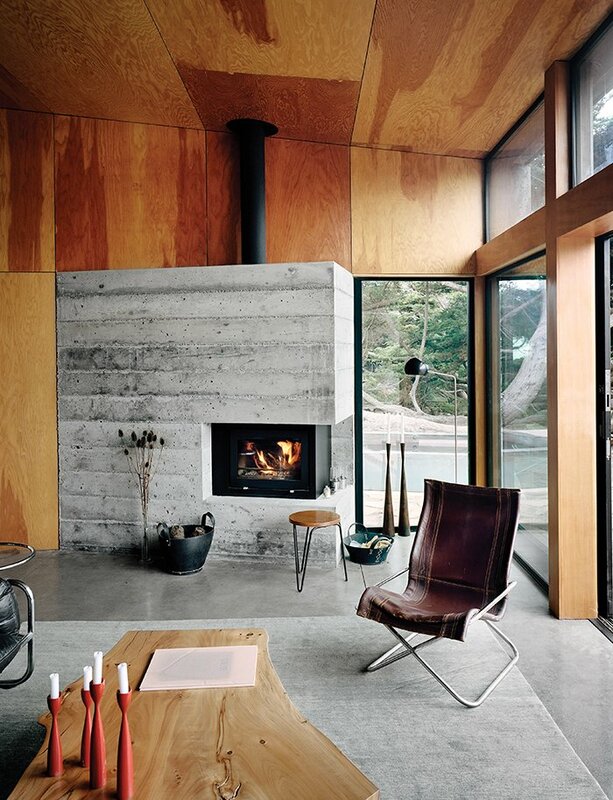 Homes were designed to sit gently on the land and are built-in a mid-century rustic vernacular: timber-frame structures clad in wooden siding or shingles, and designed to open onto the landscape. Homes blend into the landscape, sitting low to withstand the rugged winds, and are clustered together to maximize the open meadows and woodlands to be enjoyed by all. Connection to nature is crucial, and during my stay I enjoyed viewing the resident deer, jack-rabbits, turkeys, and varied coastal birds, along with the local frogs that lived under the deck. Blend into nature. Inspiration and lessons abound at Sea Ranch. First, homes are set close to the land, with the boundaries between home and open-space blurring. 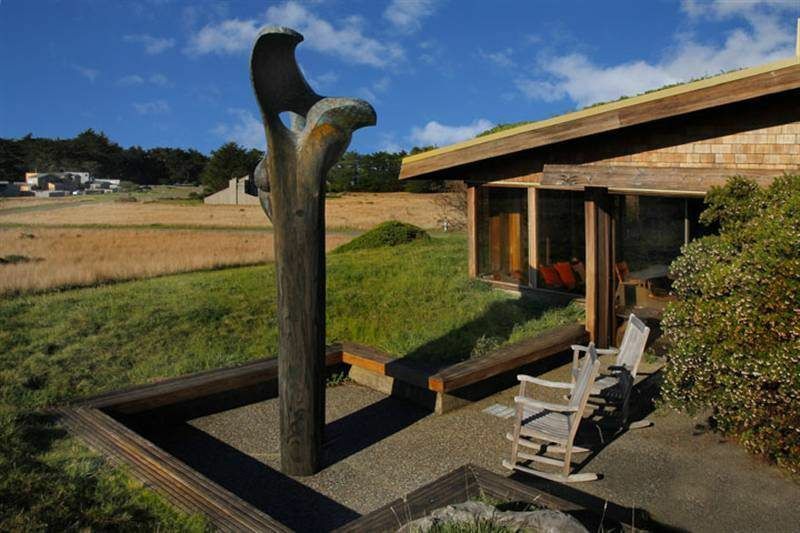 Home by Joseph Esherick hugs low to the ground, with sod roof and heavy timbers. Window seats. You probably know that I love a good window seat…probably a reflection of upbringing on the farm, where being immersed in nature was a fact. 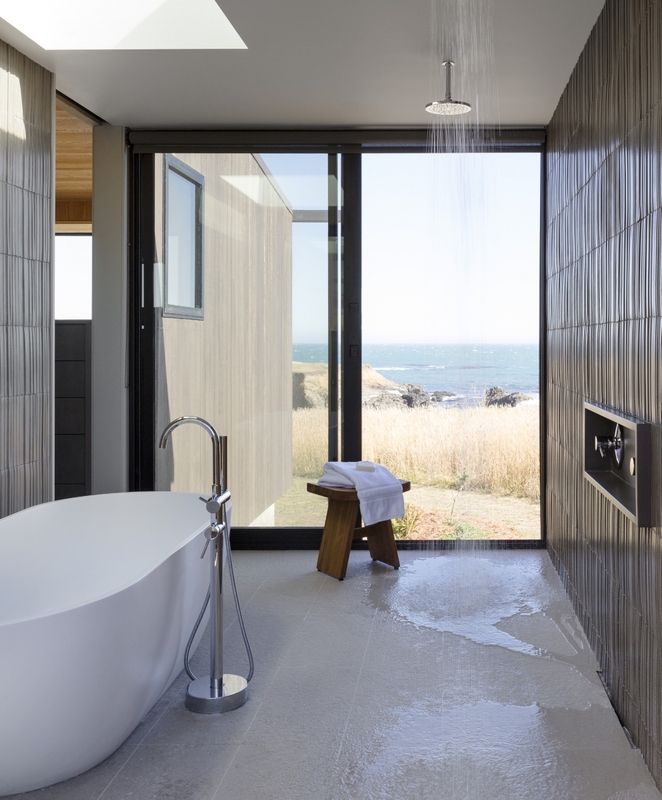 At Sea Ranch, expansive walls of glass are coupled with sprawling window seats, allowing one to chase the sun, to take a nap, or to entertain family and friends. Here the biggest decision often comes down to where to sit for the best view. 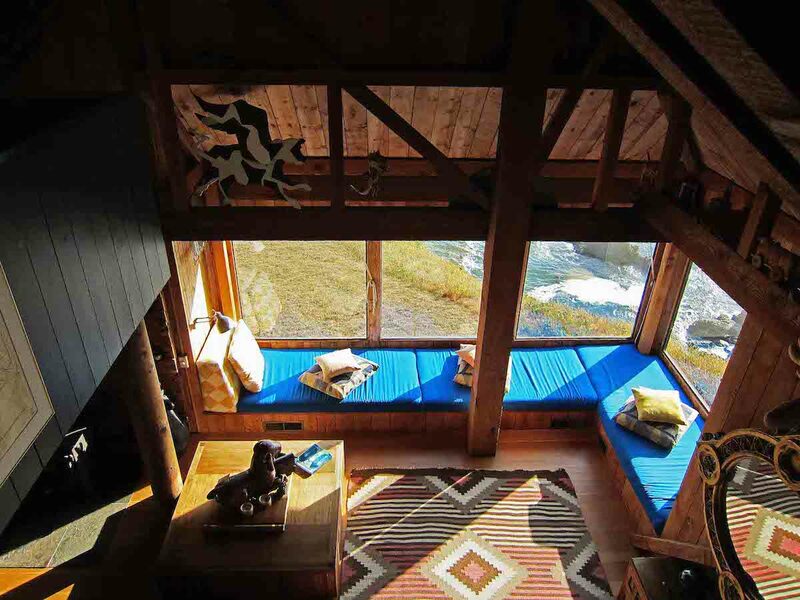 Window seats help to connect to nature. 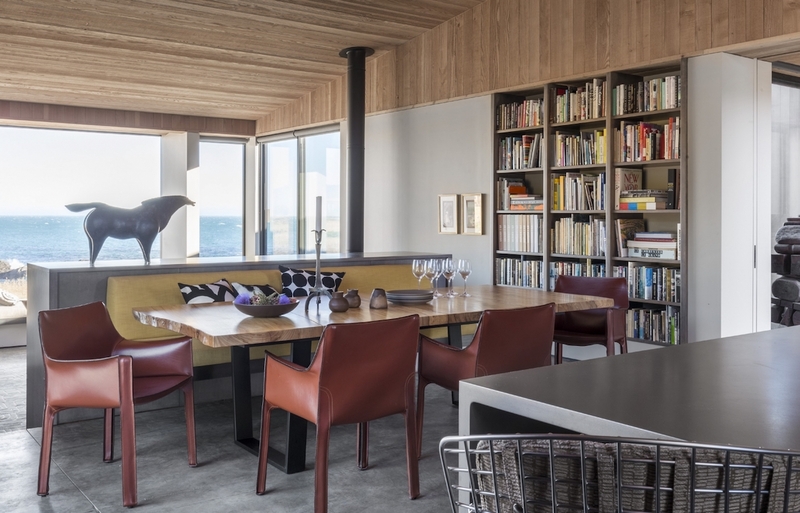 Charles Moore’s residence in Condominium One hovers over the ocean. Moore was one of the formative influences on my role as a designer. Cascading levels. Along with blurring boundaries, many of the homes follow the graceful slope of the land. In part this is due to a height limit of 16′. 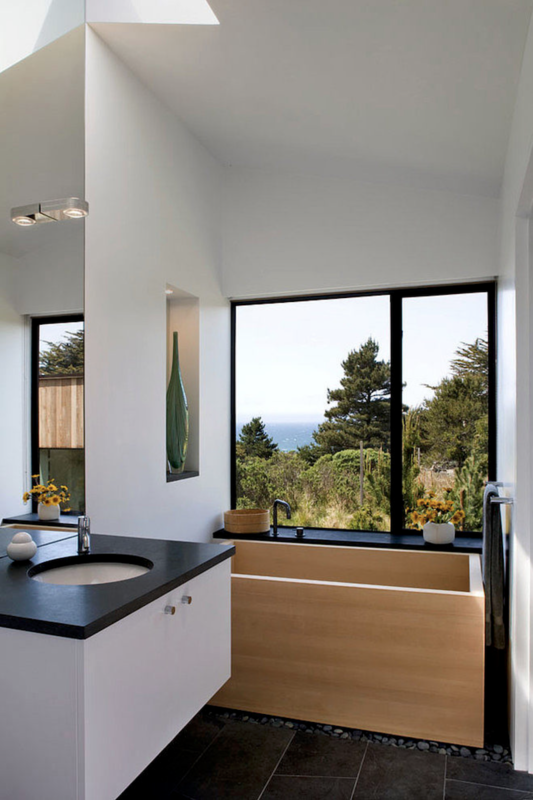 The result is interior spaces that unfold gracefully, with the view of sea and meadow always within reach. The interior slope gently towards the view. Built-in bookcase create the illusion of a larger space. Radiant heat floors keep the home comfortable, and practical. An original model home, at under 1000 sf, uses inexpensive material and offers variation through level changes. Renovation by Framestudio. Photography by Drew Kelly. Simple materials complement this renovated kitchen by Framestudio. Photography by Drew Kelly. Dual purpose. A headboard is also a closet. A sofa back is also a bookcase. 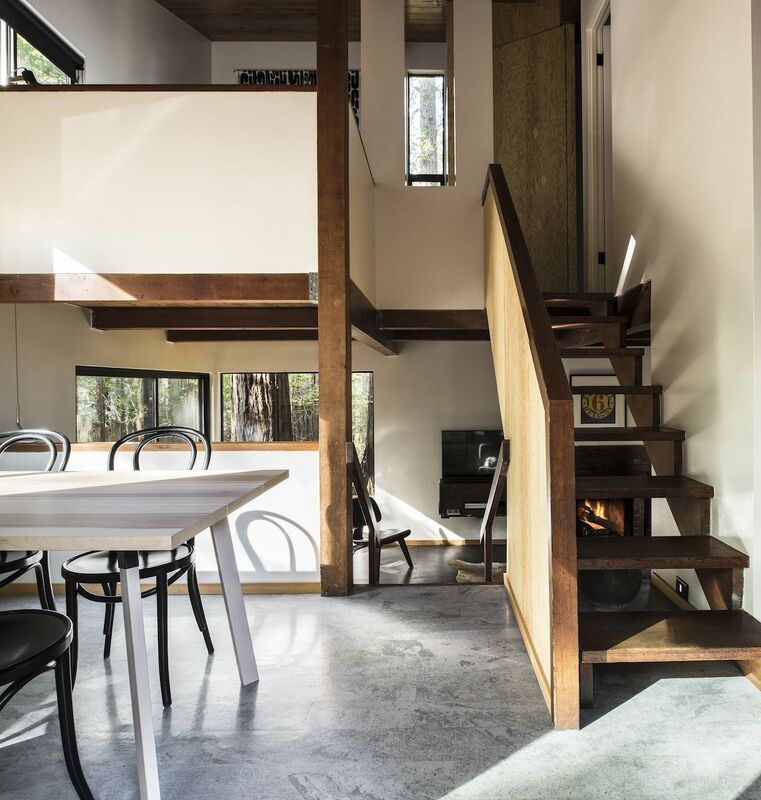 In small homes, multifunctional custom pieces take on greater importance, expanding our experience of space. 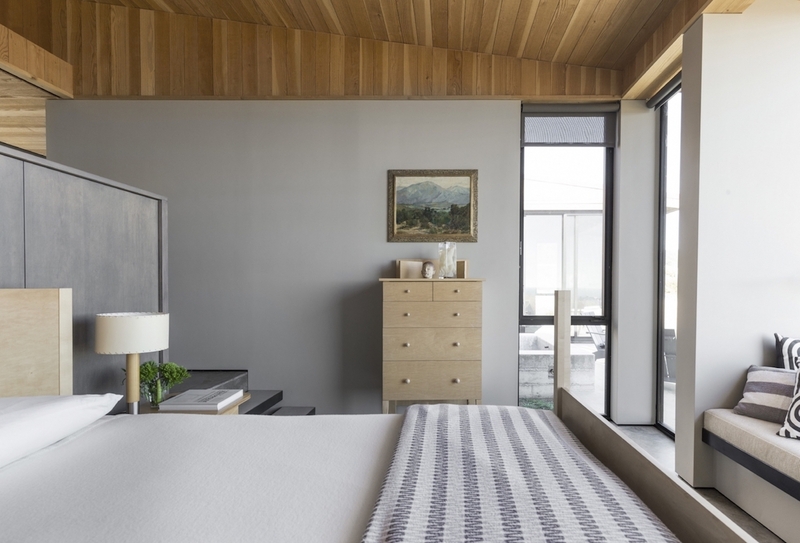 A half-height closet backs the bedroom, where window seats replace chairs. 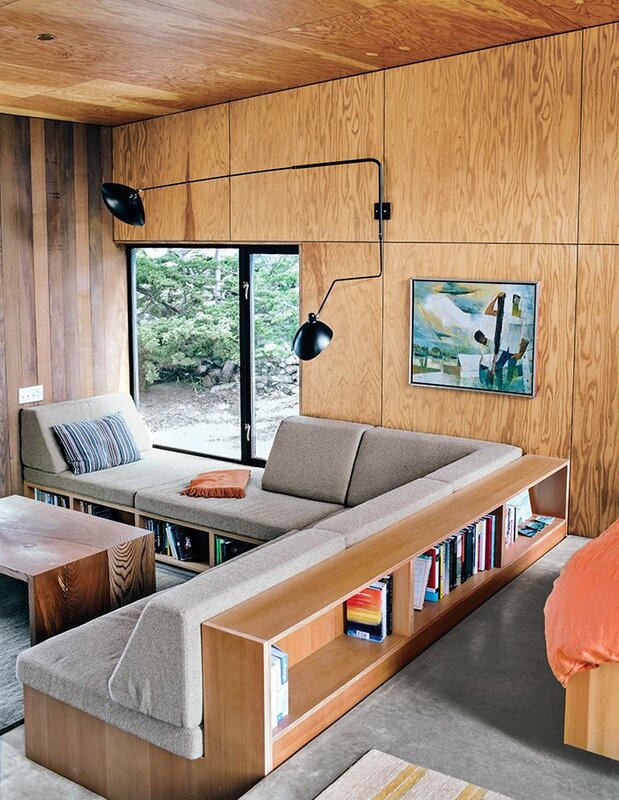 Here a sofa-back doubles as a bookcase in the bedroom. Wood cladding. 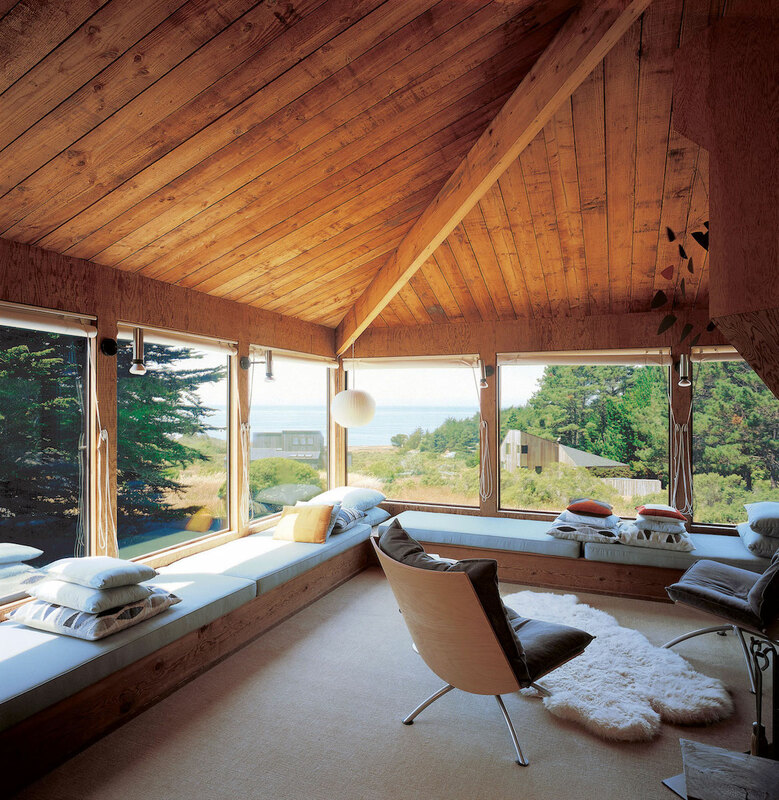 Original to the aesthetic of Sea Ranch, ceilings and walls of untreated, smooth cut lumber are a common sight. The simplicity references the local vernacular of farm sheds, and creates an informal tone. One of the consequences is that yellow/orange are a near constant in any interior. Poured concrete, sisal, white walls and grey accessories act as a counterpoint to all this wood. Intimate spaces. Small rooms, quiet corners, and private rooms all frame a view, elevating daily activities into reflective moments. Sit back and enjoy your morning coffee, and enjoy the view of deer grazing in the meadow. 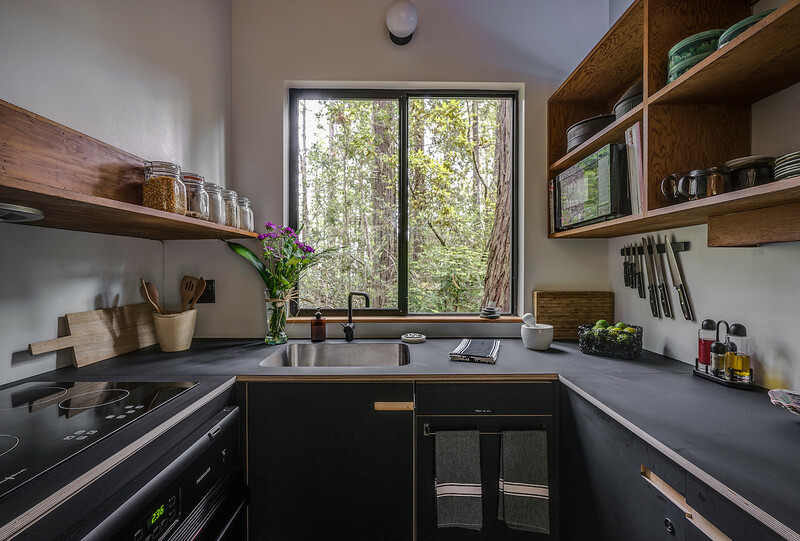 William Turnbull created an intimate dining area off the kitchen, which connects to the forest landscape outside. Bath with a view. 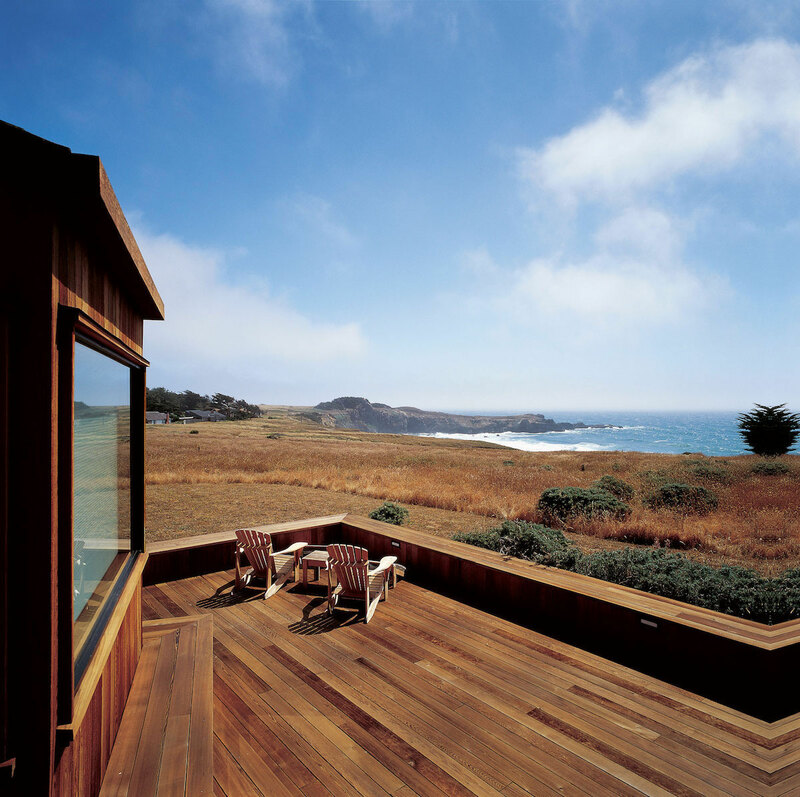 One of the pleasures about Sea Ranch is the restriction of public pathways, which allow for great privacy. Here, only the sea birds can see you taking a bath. A Japanese soaking tub provides an intimate connection to nature. Follow my day job at Bjørn Design.